This July 4th, guests at The Hay-Adams, located at 800 16 Street, NW in Washington, DC, can experience the excitement of the festivities far above the bustling crowds attending the Capitol Fourth fireworks on the National Mall. 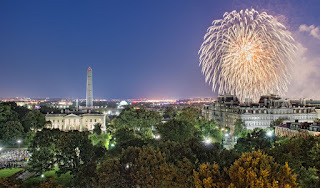 With the most amazing views of the White House and the National Mall beyond, The Hay-Adams’ Top of the Hay is the venue of choice to soak in the views and watch the country’s best fireworks display. One must book early for The Hay-Adams “4th of July” package, which includes a luxuriously appointed guestroom created by the renowned designer Tom Pheasant, a full three-course dinner for two with wine and an open bar, followed by a sparkling soirée on the 9th floor, at the legendary Top of The Hay, overlooking the White House, Monuments, and the National Mall. From this perfect perch, patrons gather to view the Capitol Fourth's spectacular fireworks display, while enjoying a full open bar, butler passed cocktails, and a buffet featuring Pastry Chef Josh Short’s house-made dessert delights, including his signature Strawberry Shortcake, ice creams and candies, ideal for a summer night. Guests dining in the comfortable elegance of The Lafayette will enjoy a three course prix-fixe menu reflecting the holiday, featuring refreshing offerings such as chilled soups, seasonal salads and an extensive raw bar. Entrée choices include summer favorites such as Pan Seared Maryland-Style Crab Cakes, and Soy and Ginger Marinated Salmon. In The Hay Adams Room, diners will enjoy a selection of items artfully displayed buffet-style, to mirror and expand upon the pre-fixe menu, including July 4th favorites, barbecued chicken and ribs. Families may be especially drawn to this buffet designed to appeal to younger Hay-Adams guests who enjoy returning to their favorites before the fireworks begin. Dinner reservations at both venues are available from 5:30 to 7:30 PM, and are subject to availability. All dining reservations must be made at the time of booking. The Hay-Adams “4th of July” package is available from $1,249 (excluding tax and gratuity) for a superior room for two adults. Children 12 years and under joining in the celebration may be included for $125 per child. Reservations are made by calling (202) 638-6600, and a non-refundable payment will be secured at the time of booking. For guests who wish to explore the wonders of Washington DC a little longer, additional nights are available from $379 per night (excluding taxes.) Dinner reservations in The Lafayette or The Hay Adams Room, as well as the reception at the Top of The Hay, are for guests who reserve The Hay-Adams “4th of July” package only.